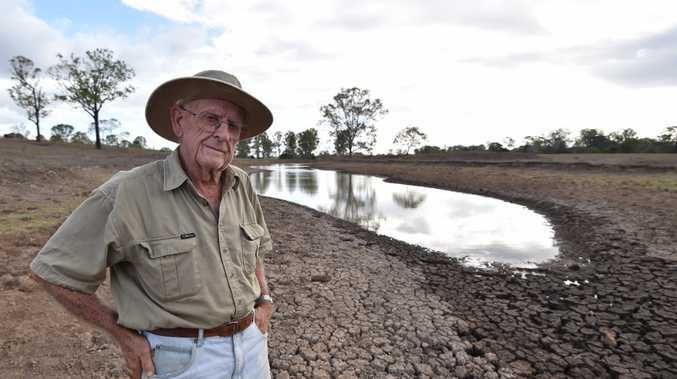 JUST weeks ago, the parched paddocks at Cyril Barbeler's cattle farm were dirt and dust. Now, thanks to the 15 inches of precious rain that fell across the Fraser Coast this month, his Tinana property is unrecognisable. The Chronicle had photographed the drought-sticken farmer in February when tell-tale cracks had formed where his dam once was. 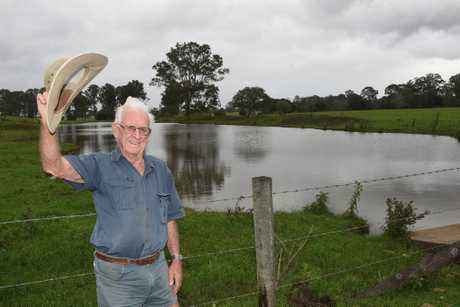 Soon after, Cyclone Debbie dumped heavy rain on the property but up until this week, just three inches of rain had fallen on Mr Barbeler's property in six months. "The poor old cows were virtually walking on dirt," he said. Mr Barbeler said his cattle had been following him around before the rain because there was no grass to graze on. Yesterday, his 150 head of cattle were nowhere to be seen, busy enjoying the lush green grass. "It's a feast or famine," Mr Barbeler said. At the nearby Burtons Milk dairy, Dion Burton, said a month ago, his paddocks were also bone dry. 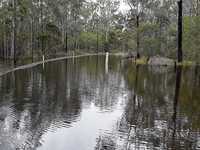 The dams on his property were down to about 50 per cent but are now overflowing. "It's either all or nothing, we just roll with it," he said. "It's a huge difference it can make in a couple of weeks," Mr Burton said. "We needed it badly, we hadn't had much rain since March. "That's mother nature for you." About 70 dairy cows are kept on the property. Ironically, Burton's Milk has received a bit of a spike in the past few days as people stocked up ahead of the weather event. "People are supporting us well," he said, adding he was confident of keeping up the supply. 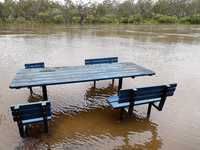 The Fraser Coast has had more than 400mm of rain for the month since the start of October. Much of that has fallen since Sunday. Hervey Bay has already broken a record for the wettest October with a total of 416mm for the month. A spokesman from the Bureau of Meteorology said showers were likely this morning but there was a possibility of sunshine in the afternoon with expected temperatures between 24 and 26. Temperatures between 20 and 26 degrees are expected on Friday. The spokesman said more rain was likely on the weekend as another system moves through, but wasn't likely to be as heavy as earlier this week. 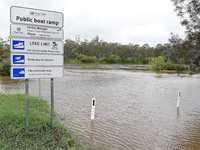 In Maryborough, 403mm was recorded by the bureau by 9am on Tuesday. 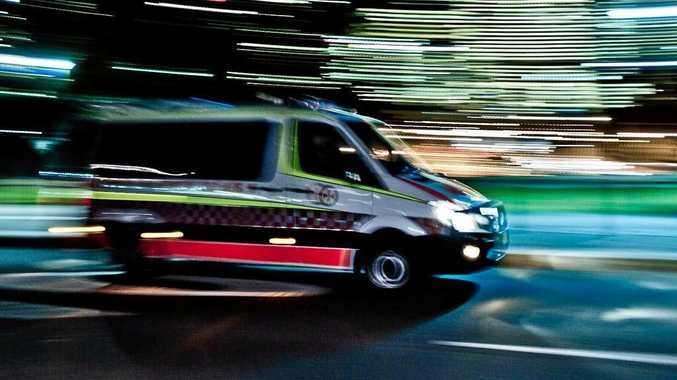 In outer-lying areas, the bureau's gauge at Tiaro recorded 177mm of rain over the past week alone, while Torbanlea had 312mm in the same period. Fraser Coast SES Unit Deputy Local Controller Helen Scott said the team had been kept busy during the wet weather. "We've had a pretty full on past three days," she said. Ms Scott said the public had helped out by going to the depot and filling their own sandbags ahead of the wild weather. She said the SES did have to deliver some bags, but the public had played a big role in ensuring their properties were safe. "Our guys help them pack the sand bags," she said. The SES had also helped out people who had leaking roofs, with Ms Scott estimating between 20 and 25 homes had been affected by leaks during the heavy downpours. Howard SES group leader, Louise Crittenden said many residents had taken initiative and necessary precautions. "We've been quite lucky because most people have been prepared," she said.